Background: The aim of the study was to investigate the effects of probiotics on moderate or severe atopic dermatitis (AD) in young children. Methods: Fifty six children aged 6–18 months with moderate or severe AD were recruited into a randomised double blind placebo controlled trial in Perth, Western Australia; 53 children completed the study. The children were given a probiotic (1×109Lactobacillus fermentum VRI-033 PCC; Probiomics) or an equivalent volume of placebo, twice daily for 8 weeks. A final assessment at 16 weeks was performed. Results: The main outcome measures were severity and extent of AD at the end of the study, as measured by the Severity Scoring of Atopic Dermatitis (SCORAD) index. The reduction in the SCORAD index over time was significant in the probiotic group (p = 0.03) but not the placebo group. Significantly more children receiving probiotics (n = 24, 92%) had a SCORAD index that was better than baseline at week 16 compared with the placebo group (n = 17, 63%) (p = 0.01). At the completion of the study more children in the probiotic group had mild AD (n = 14, 54%) compared to the placebo group (n = 8, 30%). Conclusion: Supplementation with probiotic L fermentum VRI-003 PCC is beneficial in improving the extent and severity of AD in young children with moderate or severe disease. Morbidity and mortality from allergic disorders has dramatically increased over the past half century, such that these disorders are now the most common chronic diseases of childhood in the developed world.1,2 Atopic dermatitis (AD) is frequently the first manifestation of atopic disease in infancy,3 causes enormous physical discomfort, and imposes huge demands on family time and resources.4,5 This has highlighted the need for novel strategies to reduce the burden of disease. The use of probiotic bacterial products has recently been explored as a therapeutic option for AD.6–8 The rationale for this approach is based on the well recognised effects of bacteria on cellular immune responses. There has been speculation that exposure to these microbial agents in early life could play an important role in maturation of type 1 T helper cell immune responses9 and could inhibit the development of allergic type 2 T helper cell responses and allergic (IgE) antibody production.10 There is also some evidence that normal gut flora (including probiotics) may have additional immunomodulatory properties11 and may play an essential role in the development of normal immune tolerance.12 There has been speculation that the recent rise in allergic diseases (including AD) may be linked to reduced bacterial encounter in progressively cleaner environments.13–15 Although there is no definitive proof of this, supportive epidemiological evidence16–18 has provided an additional basis for using probiotic bacterial products to treat disease. There have been several preliminary studies to address the effects of probiotics in AD. Two of these reported a clinical improvement in infants with AD who were either exclusively breast fed6 or had coexistent cows milk allergy,7 when given a lactobacillus probiotic supplement. A further crossover study demonstrated an improvement in reported symptoms compared to placebo, although this was not associated with a significant improvement in objectively assessed extent and severity8 as determined using the Severity Scoring of Atopic Dermatitis (SCORAD) index.19 Although these studies showed promising results, it is not known what effect probiotic supplementation has on unselected young children with more severe AD. 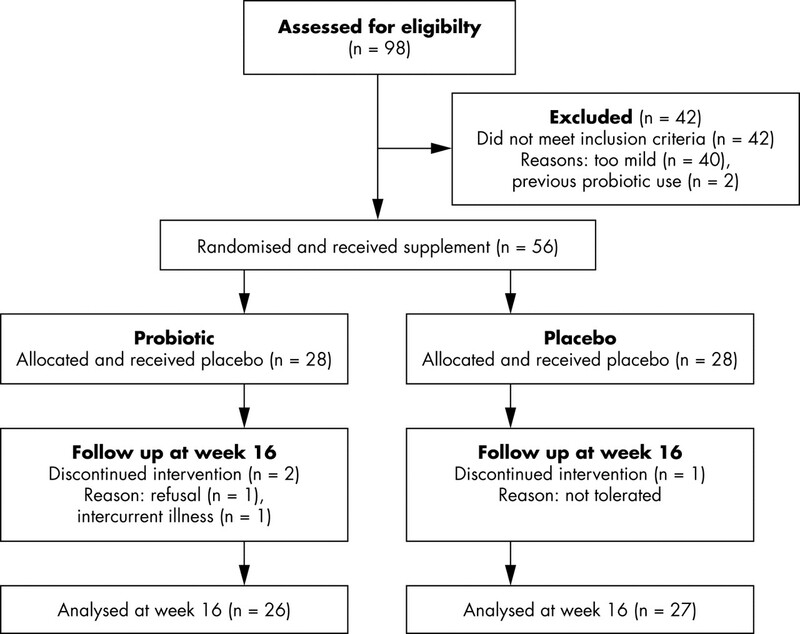 To address this issue, we conducted a randomised, placebo controlled trial to determine the clinical effects of Lactobacillus fermentum supplementation in 6–18 month old children with moderate or severe AD. Fifty six children aged from 6 to 18 months with moderate or severe AD were recruited between April and November 2003 from the general community and from outpatient clinics. All children met the Hanafin and Raijka criteria for AD and had a modified SCORAD score ⩾25.20,21 Children were ineligible for the study if they had prior exposure to probiotics, were currently taking a course of antibiotics, or had other major medical problems. The study design is a randomised double blind placebo controlled trial. To detect a 50% reduction in SCORAD index scores at the 5% significance level with 80% power, 23 children per group are required. We recruited a larger number to allow for an estimated 10% withdrawal rate. A computerised randomisation schedule was prepared by the hospital biostatistician with allocation and dispensing of sachets by the pharmacy department. The probiotic and placebo sachets were matched for size, shape, and volume of contents. The groups were stratified and block randomised according to the following criteria: (a) modified SCORAD (25–50; 50 and over), (b) current topical corticosteroid potency (none; mild or moderate; potent or very potent),22 and (c) age (6 to 12 months; 12 months and over). Participants in the probiotic group received 1 billion cfu of L fermentum VRI-003 PCC (Probiomics, Eveleigh, NSW, Australia) freeze dried powder twice daily for 8 weeks. The control group received maltodextran without probiotics twice daily for the same duration. Both supplements were dispensed as a stable powder in identical individual 1 g sachets, reconstituted by parents with 5–10 ml of water and administered orally as a suspension. Compliance was monitored by use of a sachet chart (completed by parents) and sachet counts. Participants were first seen at baseline (week 0) when they were assessed for eligibility, provided parental written informed consent, and commenced intervention (fig 1). All patients who met eligibility criteria were randomised. Participants had clinical assessments at week 2, week 4, and at the end of intervention week 8, and final assessment at week 16. Topical corticosteroid use was continued under the guidance of the patient’s own physician. Three participants withdrew from the study within the first 4 weeks (fig 1). One child experienced vomiting on day 5 as part of an intercurrent illness and after commencing antibiotic therapy the parents found multiple drug administration difficult and withdrew. Two children (one in each group) withdrew due to refusal of the suspension. Fifty three patients were available for analysis. Consort statement: progress of participants through the trial. A detailed history was obtained at baseline with follow up questionnaires at each of the other visits. A SCORAD assessment was also performed at each visit by a clinician who was blind to the intervention. The primary outcome measure was change in the severity of AD as assessed by the SCORAD index. Other outcomes included: (a) change in family quality of life as reported in the Dermatitis Family Impact Questionnaire (DFIQ), (b) change in reported topical corticosteroid usage, and (c) parental impression of the intervention. The SCORAD index19 is a tool used to assess the severity of AD by combining evaluation of extent, intensity of lesions, and subjective symptoms (pruritus and sleep loss). A modified SCORAD is obtained by using only the assessment of extent and intensity, omitting subjective criteria.21 To ensure consistency, a single investigator performed all SCORAD assessments at weeks 0, 8, and 16. The DFIQ is a tool to measure the impact of AD on family function.23 Parents reported topical corticosteroid usage as frequency of use and potency required, prospectively in a diary. A steroid score was calculated from number of applications per week multiplied by potency used. At completion of intervention parents were asked if their child’s AD was better, worse, or unchanged since commencing supplementation. At week 16 they were similarly questioned about any change during the follow up phase. A 5–10 ml sample of blood was collected from each participant at baseline. Plasma was frozen and then stored for analysis at completion of the study. Levels of total IgE and radioallergosorbent test (RAST) results were obtained using standardised commercial fluoroimmunoassays (Pharmacia CAPSystem for specific IgE and the Pharmacia ImmunoCAP for total IgE; Pharmacia, Uppsala, Sweden). Antigen specific IgE to food allergen mix (egg white, milk, cod, wheat, peanut, and soya bean), grass allergen mix (couch, rye, timothy, meadow, johnson, and bahia) and house dust mite were determined from the baseline plasma sample. Specific IgE >0.35 kU/l were considered positive. Differences between the probiotic and placebo groups were assessed using the χ2 test for nominal data. The differences in SCORAD index scores from baseline were non-parametric and analysed using Mann-Whitney U test to compare groups at each time point and Freidman’s one way analysis of variance to compare change over time in each group. Total IgE data were log natural transformed to describe the geometric mean. Statistic analyses were performed using SPSS software (Version 10 and 11 for Macintosh; SPSS, Chicago, IL). A p value <0.05 was considered statistically significant for all analyses. The Princess Margaret Hospital for Children Ethics Committee approved the trial. Fifty six children were recruited into the trial, 30 males and 26 females. There was no significant difference between the probiotic and placebo group in any of the baseline characteristics displayed in table 1. The majority of participants (n = 49; 88%) were using topical corticosteroids, 54% of participants had been exposed to antibiotics in the past, and half were regularly consuming yogurt at the commencement of the study. The majority (95%) of children had been breastfed and 38% were still being breastfed. Fifty three participants (95%) had at least one parent with a history of allergy (asthma, allergic rhinitis, or AD). Only three (5%) children had doctor-diagnosed asthma, although 13 (23%) were reported by parents to have had at least one episode of wheeze. Clinical food allergy was common, with 16 (29%) cases having had a reported immediate-type allergic reaction to food. Total IgE was elevated in 43 (77%), and RAST testing for specific IgE was positive to food mix in 40 (71%) and to house dust mite allergen in 12 (21%). No children had elevated specific IgE to grass mix. Compliance, as reported by parents, was good with 94% of doses administered and no difference between the groups (p = 0.87). The differences in the SCORAD index from baseline at each time point are presented in table 2, with greater improvement in the probiotic group compared to the placebo group. Firstly, the reduction in the SCORAD index over time was significant in the probiotic group, but not in the placebo group (p = 0.03 and p = 0.83, respectively, using Friedman’s analysis of variance). Secondly, this change was manifest in a difference between the two groups that approached the conventional level of statistical significance at week 16 (p = 0.06) as shown in fig 2A. The same pattern was apparent for the components of the SCORAD index as indicated in table 2. To determine if these effects were also apparent within individuals, a further analysis was undertaken. Week 16 SCORAD index scores were categorised as better than baseline versus worse than baseline for each group (individual data in fig 2B). Using a χ2 test of independence on the frequencies, the probiotic group was significantly more likely than the placebo group to be better than baseline at the end of the study (n = 24; 92% and n = 17; 63%, respectively; p = 0.01). Finally, more children in the probiotic group had mild AD at the end of the study (n = 14, 54%) compared with the placebo group (n = 8, 30%), although this did not reach statistical significance using Fisher’s exact test (p = 0.066) (fig 2C). Change in extent and severity of AD during the study. (A) The differences in the SCORAD index from baseline (box plot) are shown for the probiotic L fermentum VRI-003 PCC group (shaded boxes) and the placebo group (white boxes) at each follow up visit. 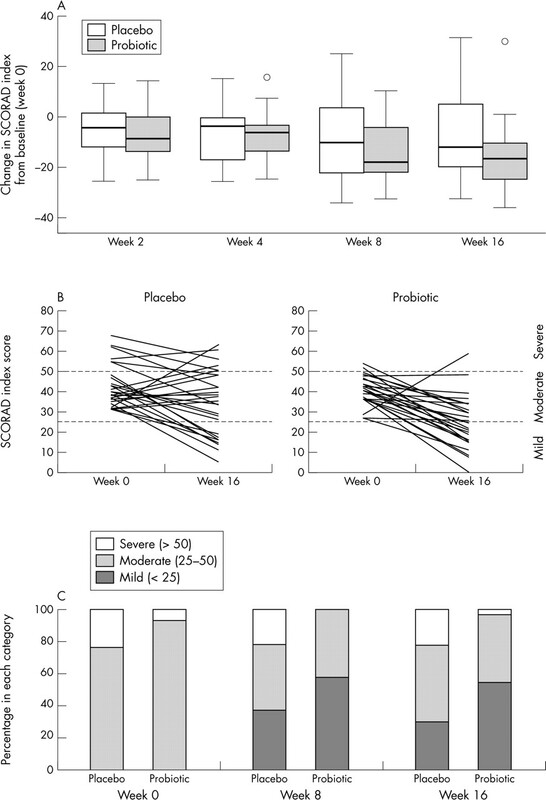 (B) Baseline and follow up (week 16) SCORAD index scores are shown for each participant in the placebo and probiotic groups. (C) The proportion of children in the mild, moderate, and severe categories of AD at baseline, end of supplementation (week 8), and at follow up are presented for the placebo and probiotic groups. The median differences in DFIQ scores at end of intervention and at follow up are presented for each group in table 3. There was an improvement in the quality of life score over time in both groups. In response to questioning about whether their child’s AD, was better, worse, or unchanged during intervention and during the follow up period, parental perceptions of severity were similar for both groups (table 3). Overall, 62% of parents in the probiotic group and 73% in the placebo group reported they would continue the supplement their child was on after conclusion of the trial. The amount of topical corticosteroid applied was derived from the potency and number of applications reported per week. The differences from baseline at each time point are shown in table 3. The change in topical corticosteroid use over time was not significant in either group (probiotic group, p = 0.2; placebo, p = 0.6). The correlations between change in corticosteroid use and change in the SCORAD index in each group were small. Twenty one (40%) children received antibiotics during the trial, with similar numbers in both groups. Significantly less children in the probiotic group had lower respiratory tract infections as reported by parents, compared to the placebo group (12/26, 46% and 20/27, 74%, respectively; p = 0.04). There were no significant differences between the groups in number of children having episodes of vomiting, diarrhoea, gastroenteritis, fever, wheezing, coughing, or ear infections. No specific adverse events were recorded, although, as previously described, one child experienced vomiting of concern to the parents. This is the first study to show a benefit following administration of probiotics in children with moderately severe AD, and provides further evidence for a role of probiotics in the management of this condition. Although the children in our study were recruited from the general community, they had more severe disease compared to the two previously reported smaller preliminary studies.6,7 One study included children with mild disease (median SCORAD score of 16 at inclusion) and observed complete resolution in all participants at 6 months, although this occurred more rapidly in the group receiving probiotics (Lactobacillus GG or Bifidobacterium lactis).6 The previous studies also included younger infants (mean age of 4.6 months,6 age range 2–15 months7) who were more likely to have milder and more transient forms of the disease. In the present study we demonstrated that slightly older children (mean age 11.5 months) with more severe dermatitis (mean SCORAD score of 41) were significantly more likely (92%) to show an improvement in the extent and severity of their lesions after receiving L fermentum VRI-003 PCC. There was a distinct, although non-significant, reduction in the SCORAD index in both groups during the first 2 weeks of the study. This may be due to improved compliance with previously prescribed treatment regimes, and highlights the need for a 2 week lead-in period in future studies before supplementation is commenced. An improvement in the placebo group at the end of the study also reflects the natural tendency for AD to improve in this age group. As severity is a major determinant of prognosis,24 the patients in this study were more likely to experience persistent disease. The effects of potential confounding factors (age, severity of AD, strength of topical corticosteroids) were controlled by stratified randomisation. Despite this, there was a small non-significant difference in the SCORAD index between the groups at commencement of the study. However, the magnitude of the change and the consistency and number of children who improved all indicate that the findings are a clinically significant effect. The benefit of probiotics was not affected by age, severity, strength of topical corticosteroids, or antibiotic or yoghurt consumption. The findings suggest that L fermentum VRI-003 PCC supplementation may accelerate the natural tendency for AD to improve in young children with more severe disease. This is also the first study to show persisting benefits 2 months after supplementation ceased. Possible mechanisms of this sustained effect may relate to persistent changes in faecal flora and/or persistent immunological effects. This will be the subject of ongoing studies using samples collected from this cohort. The potential mechanisms of action of probiotics are not well understood, but are believed to be mediated by immunological effects initiated in the gastrointestinal mucosa (reviewed by Murch25). Animals raised in germ free conditions show profound immune dysregulation,12 suggesting that gut micro-organisms are essential for normal immune development and oral tolerance. As such, there has been growing speculation that normal human immune development may have been affected by alterations in colonic flora and progressively cleaner environments. If the beneficial effects of probiotics on AD are also associated with effects on developing immune responses, it is also possible that they could modify (or even prevent) allergic responses to aeroallergens and the expression of persistent airways disease. These issues need to be addressed in future studies. Although the significance of the reduced number of lower respiratory tract infections reported by parents in children receiving probiotics is not clear, it is possible that this could indicate other effects on immune competence. Children with AD are also at increased risk (up to 80%) of developing persistent respiratory tract disease (allergic rhinitis and asthma),3 which may also be modified by early use of probiotics. In summary, this study provides evidence that oral L fermentum VRI-003 PCC may improve the severity of AD in young children and shows that these effects persist after cessation of supplementation. Further studies are needed to investigate the effects on underlying immune responses and the potential long term benefits for patients with AD and the subsequent development of associated more persistent forms of allergic disease (such as asthma and allergic rhinitis) and aeroallergen sensitisation. The authors wish to thank Probiomics Ltd for supplying the Lactobacillus fermentum VRI-003 PCC and placebo sachets. We also would like to acknowledge the contributions to this study by Elaine Pascoe, Margaret Shave, Angie Taylor, Jasmine Roper, Paul Noakes, Dr Jan Dunstan, and Dr Judith Finn. Anonymous. Worldwide variation in prevalence of symptoms of asthma, allergic rhinoconjunctivitis, and atopic eczema: ISAAC. The International Study of Asthma and Allergies in Childhood (ISAAC) Steering Committee. Lancet1998;351 (9111) :1225–32. Wadonda-Kabondo N, Sterne JAC, Golding J, et al. A prospective study of the prevalence and incidence of atopic dermatitis in children aged 0–42 months. Br J Dermatol2003;149 (5) :1023–8. Eichenfield LF, Hanifin JM, Beck LA, et al. Atopic dermatitis and asthma: parallels in the evolution of treatment. Pediatrics2003;111 (3) :608–16. Kemp AS. Cost of illness of atopic dermatitis in children: a societal perspective. Pharmacoeconomics2003;21 (2) :105–13. Emerson R, Williams H, Allen B. What is the cost of atopic dermatitis in preschool children? Br J Dermatol2001;143:514–22. Isolauri E, Arvola T, Sutas Y, et al. Probiotics in the management of atopic eczema. Clin Exp Allergy2000;30:1604–10. Majamaa H, Isolauri E. Probiotics: a novel approach in the management of food allergy. J Allergy Clin Immunol1997;99:179–85. Rosenfeldt V, Benfeldt E, Nielsen S, et al. Effect of probiotic Lactobacillus strains in children with atopic dermatitis. J Allergy Clin Immunol2003;111 (2) :389–95. Heller F, Duchmann R. Intestinal flora and mucosal immune responses. Int J Med Microbiol2003;293 (1) :77–86. Neaville WA, Tisler C, Bhattacharya A, et al. Developmental cytokine response profiles and the clinical and immunologic expression of atopy during the first year of life. J Allergy Clin Immunol2003;112 (4) :740–6. Lammers KM, Brigidi P, Vitali B, et al. Immunomodulatory effects of probiotic bacteria DNA: IL-1 and IL-10 response in human peripheral blood mononuclear cells. FEMS Immunol Med Microbiol2003;38 (2) :165–72. Sudo N, Sawamura S, Tanaka K, et al. The requirement of intestinal bacterial flora for the development of an IgE production system fully susceptible to oral tolerance induction. J Immunol1997;159:1739–45. Ball T, Castro-Rodriguez J, Griffith K, et al. Siblings, day-care attendance and the risk of asthma and wheezing during childhood. N Engl J Med2000;343:538–43. Kilpi T, Kero J, Jokinen J, et al. Common respiratory infections early in life may reduce the risk of atopic dermatitis. Clin Infect Dis2002;34:620–6. Sherriff A, Golding J. Hygiene levels in a contemporary population cohort are associated with wheezing and atopic eczema in preschool infants. Arch Dis Child2002;87 (1) :26–9. Matricardi PM, Bjorksten B, Bonini S, et al. Microbial products in allergy prevention and therapy. Allergy2003;58 (6) :461–71. Bottcher M, Nordin E, Sandin A, et al. Microflora-associated characteristics in faeces from allergic and nonallergic infants. Clin Exp Allergy2000;30 (11) :1590–6. von Mutius E, Braun-Fahrlander C, Schierl R, et al. Exposure to endotoxin or other bacterial components might protect against the development of atopy. Clin Exp Allergy2000;30 (9) :1230–4. Anonymous. Severity Scoring of Atopic Dermatitis: the SCORAD index. Consensus report of the European Task Force on Atopic Dermatitis. Dermatology1993;186 (1) :23–31. Hanafin J, Raijka G. Diagnostic features of atopic dermatitis. Acta Derm Venereol Suppl (Stockh)1980;92:44–7. Kunz B, Oranje A, Labreze L, et al. Clinical validation and guidelines for the SCORAD index: consensus report of the European Task Force on Atopic Dermatitis. Dermatology1997;195 (1) :10–19. Marley J, Baker CS, English J, eds. Getting to know your drugs. In: Therapeutic Guidelines: Dermatology. Version 2, 2004. North Melbourne, Australia: Therapeutic Guidelines, 2004:35. Lawson V, Lewis-Jones MS, Finlay AY, et al. The family impact of childhood atopic dermatitis: the Dermatitis Family Impact Questionnaire. Br J Dermatol1998;138 (1) :107–13. Illi S, von Mutius E, Lau S, et al. The natural course of atopic dermatitis from birth to age 7 years and the association with asthma. J Allergy Clin Immunol2004;113 (5) :925–31. Murch SH. Toll of allergy reduced by probiotics. Lancet2001;357 (9262) :1057–59. The principal investigator was funded by a Channel Seven Telethon Research Fellowship. VRI BioMedical supplied funding for immunoglobulin E (IgE) analysis. Ethics approval: The Princess Margaret Hospital for Children Ethics Committee granted approval for this trial. Probiotics as mainstream allergy therapy?